Enjoy a bike ride in the morning (bicycle provided) and relax with lunch and wine tasting in the afternoon. Greet the morning with scenic forest views on Oregon’s first state trail: a converted railway line with a 700 foot long trestle. Ride through sun-dappled glades and across swift, clear streams. After the ride we head to the wineries in the comfort of a luxury 7 passenger SUV. Spend the afternoon enjoying some of the world’s best Pinot Noir. 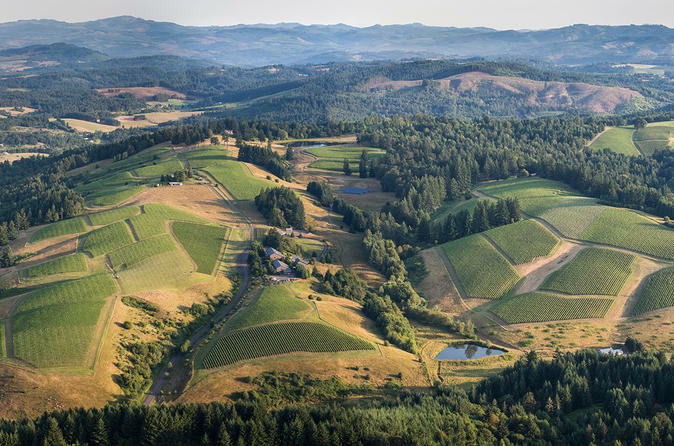 We visit and enjoy tastings (tasting fee included) at two wineries bounded by the Chehalem Mountains to the north and the Red Hills of Dundee to the south. A gourmet picnic lunch is provided with items that pair well with the wine while you take in the magnificent views at the vineyards. This all day tour is all inclusive and limited to 6 people per tour. We begin the day at Waterfront Bicycles in downtown Portland getting outfitted for the ride (27 speed bicycle is included), then load up in the luxury SUV for the trail head. After a safety briefing we spend a leisurely two hours with the guide enjoying a paved trail through a lush coastal forest. We stop at points of interest and photo ops where water and snacks are provided. After the bike ride a scenic half hour ride in the SUV brings us to Oregon wine country. We spend the afternoon at two wineries. Enjoy lunch and scenic views of the Cascade Mountains and Dundee Hills. Sip your wine and learn about the soil, topography and weather and the impact each has on the flavors you are tasting in your glass of pinot noir (lunch and tasting fees included). Unwind and catch a glimpse of what makes Oregon wines some of the best in the world. We head back to downtown Portland and arrive between 5:30pm and 6pm in time for you to enjoy your evening.